By airplane to Landvetter Airport, see www.sas.se, with Ryanair (www.ryanair.com) to Save Airport take the airport bus to Gothenburg Central Station. By train, see www.sj.se, or bus www.eurolines.com or www.swebus.se. With local buses or streetcar, see www.vasttrafik.se, also se www.goteborg.com. The nicest way of getting around in G�teborg, if you don't want to walk, is to take the tram. The city has 204 trams, wich operate 11 routes; number 1, 3, 6, 8 and 14 take you to the Ullevi Stadium. You can buy a ticket from the driver or at "Tidpunkten". For further information please go to www.vasttrafik.se or call +46 31 771 41 43 00. 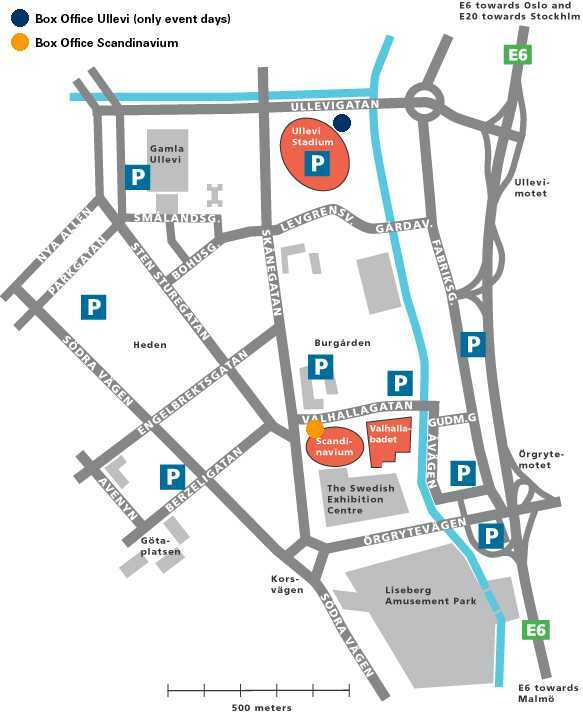 There are a lot of bars and restaurants on Gothenburg�s main street Avenyn, a short bit from the concert venue.